Thanks to the help of the Australian Volunteer Coastguard (AVCG) and Australian Navigation and Communications company, Electrotech we now have much improved real-time AIS coverage in Australia. 9 new stations are feeding us AIS data live directly from Sydney, Brisbane (3), Gladstone, Melbourne, Karratha, Cairns and Darwin. 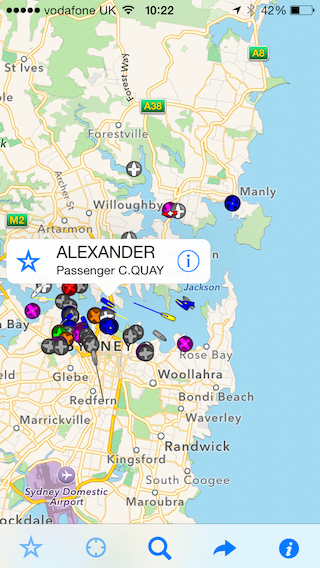 We have been working on a pro-bono basis with the AVCG in Mooloolaba, Brisbane to provide enhancements to Boat Beacon to support their world leading computer based Radio logging service. Boat Beacon now enables users to automatically “login” their boat and trip details including MMSI, Destination, ETA and Persons on board when they start a trip and “logout” again when they arrive by simply tapping the Boat Beacon Sailboat icon at the bottom left to start and stop sailing mode. We have provided these enhancements for free and AVCG , Mooloolaba are recommending Boat Beacon for use with their Radio logging service (click the link to see the video about it). 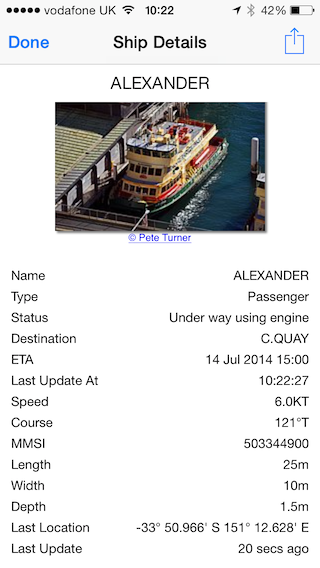 Here’s a screenshot from Boat Beacon showing the Alexander Passenger ship right now in Sydney, last update 20s ago!